I was playing around with ideas for really cool jobs and I started looking into near-future technologies. At the time holographic television was wavering on the tech horizon. I wondered what sort of new job a full-blown holographic movie industry might create. Well, the sound guys have their foley artists. How would the holographic folks get the physical sensations into those films? And so the position of sensory immersion artist was born! The flooded ruins of Venice provided both playground and prison for someone just crazy enough to take on the job of recording the experiences the rest of us are so morbidly curious about. Pit that against the surrealism of the ancient legends those crumbling stones are steeped in and you’ve got yourself a mind-bender. Too much fun! The main character, daredevil and stuntwoman, Alyse Kate Bryant, was born of the job that created her story. 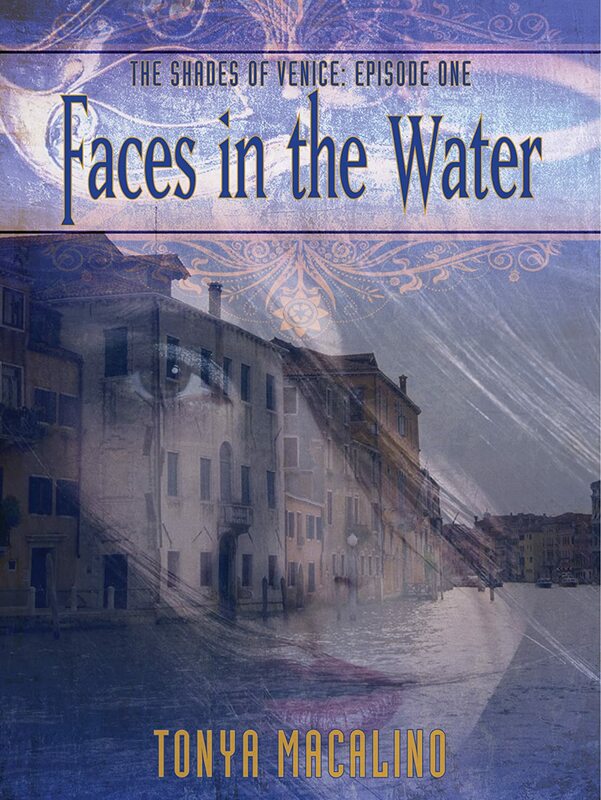 Her twisted combination of loyalty and reckless carelessness grew out of the backstory that got her to Venice in the first place. Alyse’s team, Tamsin, Ryan, and Ben are kind of composites of the ideal circle of dedicated best friends, but they all have secrets that twist them in this particular nightmare. The whole team really has to fight to remain the kind of people they believe themselves to be. As for Matteo, I wanted him to be what Alyse wasn’t, a good ol’ boy, originally from Kalispell, Montana–who has to figure out how to soldier on when chance puts him on the world’s most hated list. Mo, historical overlay: Sala del Maggior Consiglio. It took her a few moments, but layer by layer reality gave way to the ghost. Thick gold moldings grew out of the smooth surface, became the ornate frames for enormous paintings covering the entire ceiling and all four walls. The lower portions of the walls displayed wood paneling and benches, their colors and lines rich with age. Where the wall joined the ceiling was a series of smaller, molding-framed portraits, the doges. “He was right there. Hic fuit locus ser Marini Faletri decapitati pro crimine proditionis. In this place would have been Marin Falier, decapitated for the crime of treason,” a voice behind me murmured. I jumped, spun around. Jürgen Phan Mai caught my arm. I grabbed his other sleeve before I fell into him. We stayed locked like that for an eternal second. The solidity of him shocked me. Why, I’m not sure. Maybe because he didn’t look quite real. The lines of his face looked painted—by the thick brush of a Japanese master. His eyes held an almost cruel mirth. I stepped quickly back. Unfazed, he handed me a flute of pomegranate seeds floating in champagne. I gripped the champagne glass with both hands and caught myself before I took a third step back. My tripping heart held me silent. Obediently, I raised the glass to my lips. The tingle of champagne filled my mouth, the icy seeds slid over my tongue. I bit down. The tiny jewels burst in an explosion of tart sweetness. The mixture slid down my throat, warming me, opening me. Suddenly, I felt terrifyingly vulnerable standing there before him. The look in his deep eyes said he knew it, enjoyed it. I raised my glass in salute, then turned, and fled. is the national award-winning author of urban fantasy thrillers, SPECTRE OF INTENTION and THE SHADES OF VENICE series. A resident of Hillsboro, Oregon, Tonya lives with her husband, children’s author Raymond Macalino, and their two wildly imaginative kids. She is an avid collector of folklore and folk history, far too many to fit comfortably within the pages of any given book! When not working on her latest thriller, she enjoys coaching other writers through the How to Build a Book workshops at Jacobsen’s Books & More. Tonya also acts as President for NIWA, the Northwest Independent Writers Association. Love Tonya’s books? Subscribe to Tonya’s 99 Cent New Release Alerts at www.tonyamacalino.com! For weekly news and events, you can also drop by and chat with her on Facebook at www.facebook.com/TonyaMacalino or Twitter @TonyaMacalino.